Dog snoring is caused by an obstruction in the nasal passage or nostrils that leads to airway constriction. 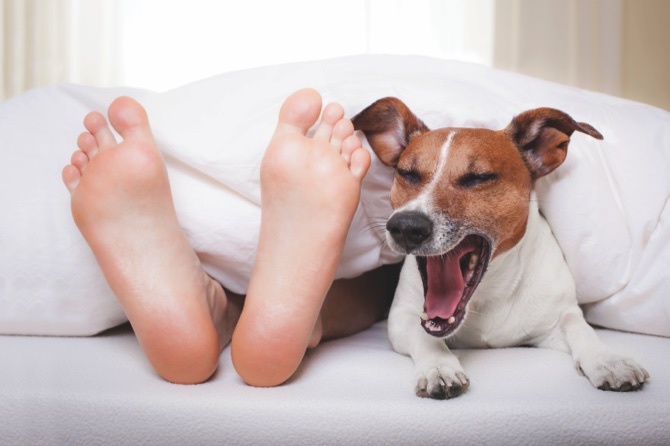 Before you try to stop the snoring, it’s necessary to understand the reasons why dogs snore so that you can either take preventive or curative measures to stop the problem. Dogs that are overweight or obese tend to have excess tissue in their throat which causes the obstruction that blocks the airways. Allergens like tree and weed pollen, dust (we have a lot in Macau) and smoke cause nasal allergies. The resulting mucus blocks the nostrils and causes heavy breathing. Certain dog breeds are predisposed to snoring. Pekinese, Pugs, Boston Terriers are known to snore as their windpipe flattens which makes it difficult to breathe. Tobacco smoke is a big irritant to your pet. As long as your dog lives in a smoke filled environment he will continue to snore. If your pet is suffering from a cold he might snore in his sleep until his nostrils are clear. If your dog is suffering from snoring caused by allergens make sure you clean his bedding every day. Walk him outdoors when the pollen levels are low and when there isn’t too much traffic. Vacuum regularly and keep rugs and curtains dust free. Regularly exercise your pet so that he will reduce in weight and the snoring problem stops. A small surgery that we perform quite frequently at RVC may be conducted on breeds predisposed to snoring. However, the surgery is generally conducted when dogs are young. Try to change the way your dog sleeps by either changing his bed or his sleeping posture. Give your dog a pillow. If he uses the pillow it will elevate his head and may reduce snoring. Avoid smoking next to your dog. Keep him in a smoke free environment. Your dog may show certain signs along with snoring that indicate underlying illnesses. If your dog doesn’t respond to any of the tips a vet check will help determine the true cause. Dog snoring can be bothersome as your dog will have a disturbed sleep pattern and wake up tired and grouchy. The noise caused due to his snoring will also prevent the owner from getting a good night’s rest. Consider keeping your dog in another room at night. Don’t be impatient or try to wake your dog from his sleep as this will do more harm than good. A round sleeping bed might stop the snoring, as your dog will curl up and this helps the airway passages to expand. If your dog has never snored before and the snoring unexpectedly emerges, take your dog for a vet check as he may be sick. Tumors or cysts don’t usually cause dog snoring but occur in rare cases. Hope this info helps our snoring dogs.